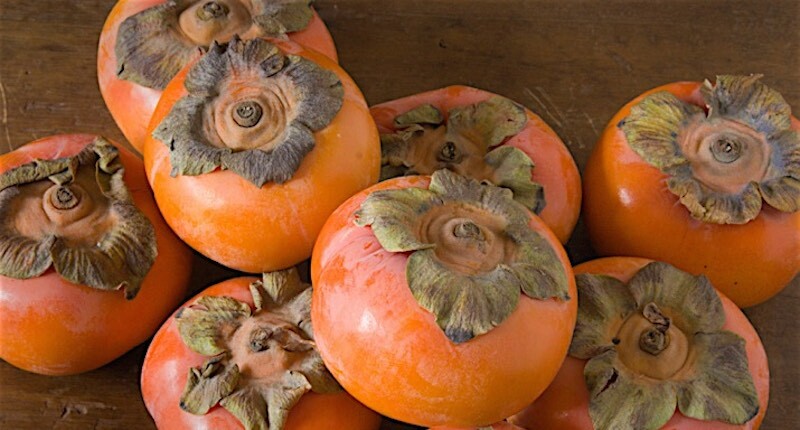 Persimmon’s native country is China, where it was nicknamed “Apple of the Orient“. From China, persimmon diffused into Japan, where it still plays a primary role in the Japanese cuisine, and then all over the world. Persimmon (Diospyros—Greek for “fruit of the gods“) is really not a fruit, but a large, round, succulent berry, with a smooth, thin peel of variable color (from yellow to brilliant orange), depending on the degree of ripening. When the fruit is fully ripe, the pulp is soft, creamy and almost gelatinous. A ripe persimmon tastes very sweet and has a “honey flavor”. Some parts of the flesh may turn brown but this is not because it has turned bad, but is actually the sugar in the fruit. There are generally two types of persimmons—astringent and non-astringent. The astringent persimmon contains high level of tannin before softening, which makes the fruit inedible. Whereas the non-astringent persimmon loses the tannin sooner making the fruit edible even while firm. The shape of the fruit varies from spherical to acorn to flattened or even squarish. The color varies from light yellow-orange to dark orange-red. The size of a persimmon can vary from about the size of small orange to as big as a grapefruit, depending on the variety. Persimmons are usually not juiced but are eaten on its own, like a mango, or pureed for making smoothies. They are highly fibrous, delicious and nutritious. Persimmon is rich in vitamins A, C and the B vitamins. In the minerals department, it is dense-packed with calcium, potassium, iron, manganese, phosphorus and copper. Cold and flu: Thanks to its high content in vitamin C, persimmon is effective in enhancing the immune system function and can help relieve the symptoms of flu and cold, as well as many other infectious or inflammatory conditions. Diuretic effect: Persimmon does have excellent diuretic properties, due to its potassium and calcium content. Eating a persimmon a day is an effective way to prevent or relieve water retention. Daily consumption of persimmon is better than the use of diuretic drugs, since persimmon does not cause potassium loss which is associated with many known diuretics. Liver health and body detoxification: Persimmon is an excellent source of antioxidants which play a key role in liver health and body detoxification. Antioxidants help neutralize toxins and other harmful substances in the body, prevent and treat the damages caused by free-radicals. Natural energizer: Persimmons are highly digestible fruits and also provide a lot of readily available energy (in the form of sugars) to sustain any energy-requiring activity. To check if persimmons are ripe, lightly depress the fruit. If it’s hard, it’s not yet ripe. Do not eat hard persimmons, unless you’re certain that you’ve got the non-astringent variety. Fully ripe persimmons are soft to the touch, very sweet and creamy that they can be eaten as they are. Simply cut them into two halves, peel off the skin and eat the pulp. They can also be used to prepare delicious sauces, creams, jams, jellies and smoothies.